It’s time for another edition of Int’l Bloggers Club and this time we’re all repurposing some form of tin cans. I can’t wait to see what my friends from around the world have done with their tin can projects. I want to take this moment to say a big thank you to this group of ladies for giving me advice on plant care for this project! You ladies are awesome!! In this post I’ll be sharing How to Repurpose Tuna Cans into Caterpillar Succulent Planter. For my tin can repurpose, I had the idea to take tuna cans and turn them into a caterpillar succulent planter. This was my first attempt at creating the planter. It would have worked except that the cut up paint stirrers were hot glued on the front, but they didn’t want to stay on for very long, so instead of making a vertical planter it became a horizontal planter. Here’s what I started with: 5 empty, clean tuna cans, 2 hangers, and a 2″x6″. Tools: drill gun, screws, hot glue, paint, and succulents. Before I mounted the tuna cans I painted them to give them a splash of color, including giving the caterpillar a face and painting his antennae green. After the paint was dry, it was time to put it together. I drilled through the middle of tuna cans and into the wood where I wanted them to be mounted. Then I used the drill gun to screw the tuna cans onto the painted 2×6. I put rocks in the bottom of the can, and then I planted the succulents. What do you think? Right now this planter is on the front porch, but I’m thinking this could even be a fun centerpiece for an outdoor table. 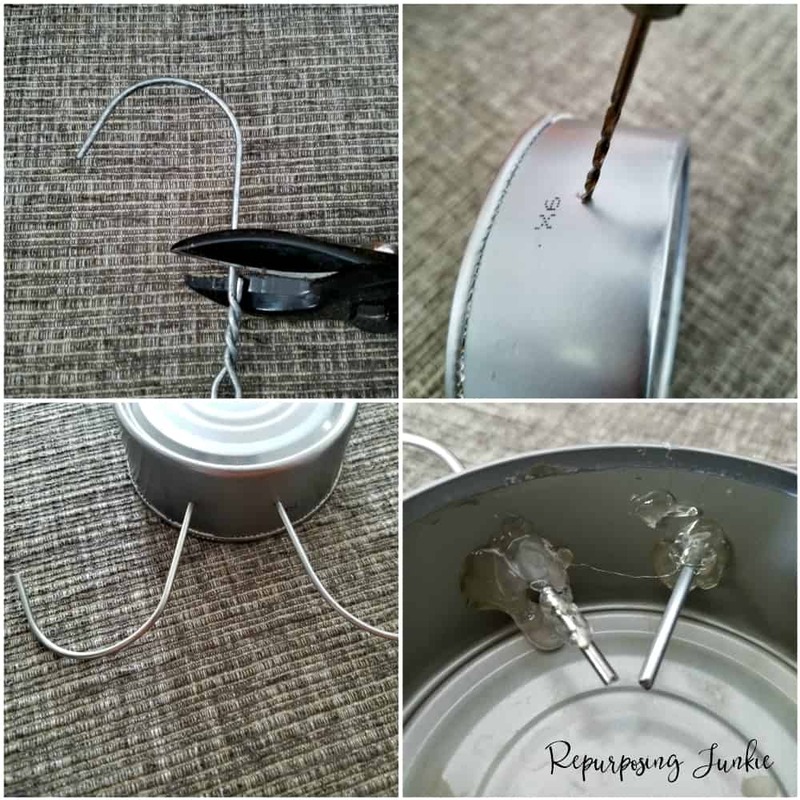 Don’t forget to check out how my friends repurposed their cans and tins. 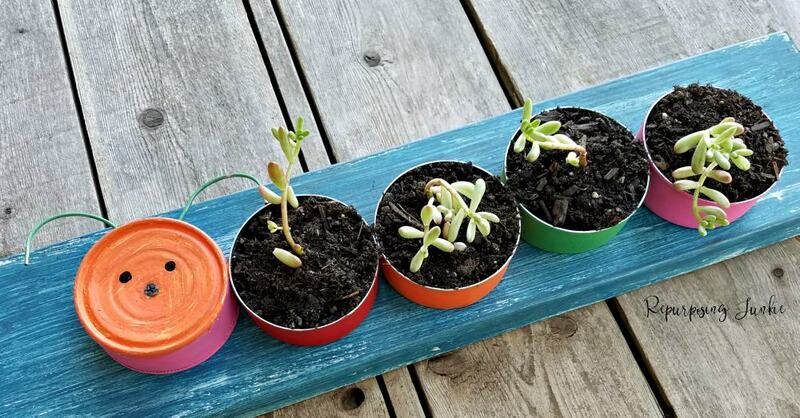 Thanks for sharing How to Repurpose Tuna Cans into Caterpillar Succulent Planter! Keri so, so super cute. All those bright and happy colors make it a fun summertime idea and yes for a centerpiece too! I really enjoyed reading this post with your super sophisticated gluing methods. I’ll definitely be saving up my tuna cans from now on! Hahaha super sophisticated gluing methods, too funny! 🙂 Thank you so much Mary!! I’ve seen a lot of tin can recycled crafts recently, this is the sweetest one. Oh yes you’re right that would be a fun teacher’s gift! Thank you Marie!! This is darling Keri! Love the orange face on the little guy! Thank you very much Florence! Your caterpillar is adorable Keri. Your first idea of creating a vertical planter is so cool, shame the paint stirrers didn’t want to stay. Anyway, the horizontal version is so cute and much easy to take care of I guess, love the antennae and the face, so sweet. This is a great repurpose, I can see teachers taking your idea to make with kids in school or parents with their homeschooled children, love it. Thanks so much Pili! Yeah it was stinky that the first version didn’t work, but I’m pretty pleased with how the horizontal version turned out. This little guy is sitting cozy on our porch. Thank you Pili!